Authors: Romakina N.A., Korshunova G.A., Kireev S.I., Sertakova A.V., Norkin I.A. Aim: development of an integrated biomechanical index that reflects the state of kinematic and static function in patients who need replacement of large joints as well as evaluation of the myoneural complex of lower extremities activity of category of patients. Material and Methods. 103 patients with osteoarthrosis of the hip and knee joints. A biomechanical survey included podography, stabilometry and dynamometry. An electrophysiological study of the peripheral nerves of the lower extremities with the determination of the amplitude of the muscle response and late neuronal responses was carried out. The level of activity of the gluteal muscles was determined. Results. The most sensitive indicators reflecting the state of biomechanical status were identified, specialized software for the integral biomechanical index calculation was developed. Conclusion. Methods of clinical biomechanics allow specialists to assess the state of kinematic and static function of the musculoskeletal system, matching of the integral biomechanical index with the data of neurophysiological monitoring makes possible to select individual tactics of treatment. All articles of the authors: Korshunova G.A., Norkin I.A. , Romakina N.A. , Sertakova A.V. 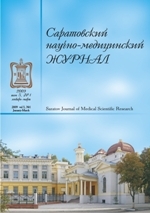 Authors: Zvereva К.Р., Markov D.A., Reshetnikov A.N. Aseptic acetabular loosening is one of the most common complications of primary hip arthroplasty Its treatment is possible in the volume of replacement of only the endoprosthesis cup with the preservation of a stable correctly oriented femoral component. The sequence of actions consists of provision of access to the acetabulum component and its replacement, after which the necessary offset is selected by changing the size of the head and installing a new pair of friction. Currently, the vast majority of the installed heads during the primary and revision hip replacement have a standard size forthe cone of the femoral component 12/14mm. According to the observations, in 3% of cases, there are femoral components with non-standard cone sizes 11/13 mm, usually established 7-8 years ago. The absence of heads forthe necessary cone leads to the need to replace the stable correctly oriented femoral component, which is accompanied by an increase in the time of intervention, the volume of intraoperative blood loss and the risk of intraopera-tive peri-prosthetic fracture. We represent the clinical case of a 75-year-old patient with a dislocation of the acetabular component and a stable correctly oriented femoral component, which during the audit intervention due to the lack of heads for an irregular cone size, total replacement of the components was made. All articles of the authors: Markov D.A., Reshetnikov A.N. , Zvereva K.P. Authors: Shemetova G.N., Ryaboshapko A.l., Gubanova G.V. Aim: to study the effectiveness of in-depth preventive counseling as one of the forms of information and training technologies for prevention of hypertension. Material and Methods. On the basis of the district hospitals of the Saratov region the analysis of volume and quality of preventive work in the group of persons with risk factors under investigation in the study of prevention and patients with arterial hypertension trained in Health School. Results. Analysis of the effectiveness of Schools for patients with arterial hypertension showed an increase in the number of people achieving the target blood pressure level from 32 to 42% and reducing the number of patients hospitalized for hypertensive crises, in comparison with the previous year by 22%. Conclusion. Schools for patients with arterial hypertension teach patients to correct risk factors and to control their disease. All articles of the authors: Gubanova G.V. , Ryaboshapko A.I. , Shemetova G.N.